Kudos to lifelonglearner for amazing cover art that is also an example of Murphy’s Law. 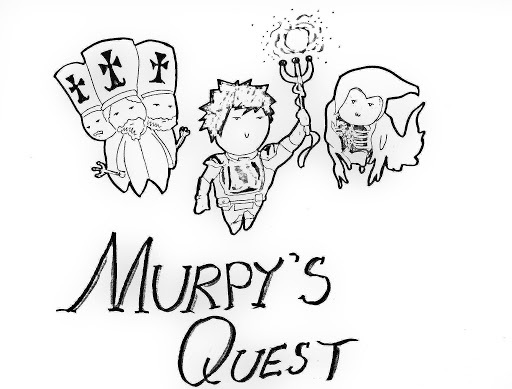 The full text of Murphy’s Quest (with many corrections) is now available in PDF. Having been kept away from expository writing for a week, I have all too many thoughts to express. This post will contain a long mishmash of my feelings about fiction-writing experienced during my week-long adventure into Murphy’s Quest. I have tried on at least three occasions in the past to write full-length novels, but this is the first product I would consider readable. This postmortem is a combination of how those projects failed, and why this one didn’t. Better writers have given writing advice. However, due to the phenomenon I once called Teaching Ladders, the fundamentals I learned writing my first viable story may be more useful to the beginning writer than the grand strategies employed by masters. If there is a single black hole remaining in my writing, it would be that I still have no idea how to write extended and psychologically dramatic scenes involving multiple thinking characters. The number of variables spins out of control too rapidly. Any ideas about how anyone has ever managed this would be appreciated. The first section will describe my motivation for writing in the style of a light novel in particular. The second section will describe the many technical details of writing I discovered along the way. In my opinion, the technical aspect of writing is altogether undervalued, and I would go so far as to say that cleaner writing directly produces cleaner thinking. I want this post to serve as encouragement for people to put out more rationalist-adjacent fiction online. HPMoR is an impossible the standard to live up to, but pretty much anyone could write at the level of Murphy’s Quest. And people still enjoyed reading it! The aesthetic for Murphy’s Quest came from Eliezer’s wonderful light novels Dark Lord’s Answer and A Girl Corrupted by the Internet is the Summoned Hero?! and the rabbit-hole of Japanese light novels they led me down. When I read the medium I instantly knew that I would not be writing full-length novels for a long long time. First of all, there’s an unbelievable psychological gap between writing a short story – which takes no more than a day or two – and a full-length novel – which takes at bare minimum a month. As far as I can tell, this gap makes it unreasonably hard to progress as a writer towards larger projects. Light novels fill this progressional gap snugly. What is it about light novels that’s so exciting? I think the answer is something like: most novels are 80% filler. We’ve all read enough novels that our minds automatically skip through and fill in the lurid descriptions of embroidered curtains sashaying like exotic belly-dancers. A story can only take so much mood-setting before it becomes mood-killing. Get to the damn boss fight already! With a light novel, the writer does the work of cutting out filler for you. Only the bones – or as I prefer the soul – of the story remains. When I skip a week-long caravan ride across a continent, I trust the the reader’s mind to fill in all the gaudy details of WeIrD fOrEiGn CiTiEs and mini-boss fights and over-the-top NPC encounters along the way. I finally finished Inadequate Equilibria the other day and am convinced that Status Regulation and Anxious Underconfidence is by far the most important chapter of them all. It’s somehow a radically fresh take on the usual refrain “just try things.” At least for me, there was an enormous psychological modesty barrier I had to overcome to write online, and another one to write fiction. What are the gears of this modesty? The first problem, Anxious Underconfidence, boils down to people being extremely risk-averse. If you try new things, most of them will fail. That’s fine. Recalibrate the base rate of failure that you’re willing to tolerate. For me repeating the mantra “If you haven’t failed in the last six months, you’re not trying hard enough” was good enough to solve this problem. Then again, I’m risk-seeking by nature. The second and more central (to me) problem, Status Regulation, is that every time I asked myself “Am I ready to write fiction?” the question I should have been asking is “How good am I at writing fiction?”, but my brain translated it to “Do I have enough generalized status to deserve to write fiction?” instead. Even properly functioning status maps are very low-resolution; I might be able to make decent decisions in my field of expertise where I’ve calibrated my status against my competence with peers of every skill level, but I sure as hell can’t about something like writing. For any given question of modesty, especially outside one’s domain of expertise, how should you decide if you’re good enough? Eliezer’s answer is that you should find a cheap way to query objective reality rather than querying your status regulation systems. Actually design a cheap experiment that will tell you if you’re good enough. Unlike my previous novel-writing projects that petered out over months, holding myself to a week-long light novel was the cheap experiment I needed to make. This section records some of the object-level rules that I’ve learned make for crisper story-telling. This is still my favorite passage about writing, from anywhere, ever. Here are three specific examples of this injunction. She shoots me a queer look. “That’s common where I come from,” I reply. “Follow my lead,” she cautions me. It should be clear from context who is speaking. This also forces you to write better dialogue in general, giving fixed speech tics and patterns to each character. Dialogue will flow more snappily and smoothly. Write in the present tense. Everyone knows to write in the active voice. But have you tried writing fiction in present tense? Almost every word is shorter in the present tense. Action feels more immediate and impactful. Thoughts more forward-looking and intimate. Write in the present tense. Protect negative space like you protect your slack. Negative space is essential in fiction. Leave as much as possible to the imagination. They say a picture is worth a thousand words – that’s why I prefer text to video. A thousand words is way too many to waste on a single frame. Negative space forces the reader to do mental work. This is a matter of taste – as a reader I like to fill in the gaps, so I’ll leave gaps in my writing. Your mind is constantly making up stories. All you have to do is look. For Murphy’s Quest, I spent a good ten hours lying in bed with my eyes closed, simply walking through the environment and seeing the sights that popped up. I also incorporated tidbits from some of my recent dreams. A story feels incomplete if characters and ideas from early on don’t reappear. I only really thought about this principle halfway through the writing of Murphy’s Quest, which makes the whole story feel incomplete. Reincorporating old details is like weaving together narrative threads. Some of my favorite moments in Murphy’s Quest are when earlier characters and occurrences reappear, especially in surprising ways. Interrupt Routines. Impro likes to say that every good story should be formed out of a series of interrupted routines. As the character moves through life, routines and patterns begin to form. There’s a moment when these routines begin to feel stale and constraining to the writer – this is when it must be broken in a surprising way. Word-at-a-time letters usually go through four stages: (1) the letters are usually cautious or nonsensical and full of concealed sexual references; (2) the letters are obscene and psychotic; (3) they are full of religious feeling; (4) finally, they express vulnerability and loneliness. Inspired by Impro, I allowed hints of the sexual and grotesque into Murphy’s Quest instead of keeping it sanitary and lighthearted. I think this was for the best. Freedom is the enemy of creativity. This is hardly surprising in hindsight: the whole point of creativity is to solve heavily constrained problems. On my previous attempts at fiction-writing, I didn’t constrain myself enough. I wanted to design all the characters, and do all the world-building, and create interesting new mythological backstories and value structures in the world. These attempts spiraled out of control, opening more threads on each page than I could handle. This time, I decided to buy in wholesale to a known, trope-filled universe with fairly straightforward rules and aesthetics. I allowed each piece of exposed information to constrain the future in a nontrivial way. By Chapter 8, I already knew exactly how the story had to end; after all, how else could a novel inspired by Murphy’s Law with 13 chapters end? I used to think constraints make writing harder, but the exact opposite is true. If you want to make fiction-writing easier for yourself, add more constraints. Remove more variables. That’s why fan-fiction is so easy and fun to write. You follow along the predetermined route, inserting novelty only when it suits you.